I've wanted a Mandoline Slicer for many years, but always been a little afraid of this super slicing machine and never got around to getting one. However, as an OXO Good Grips blogger I have had the chance to try out this classic kitchen tool and tell you all about it. 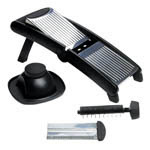 OXO’s user-friendly Mandoline is the perfect tool for creating culinary sensations quickly and easily. Straight and wavy blades can be set to any slice thickness and are ideal for making cucumber salad, crisps, onion rings and citrus slices, and try making french fries, carrot sticks and garnishes with the thin and thick julienne blades. Just turn the soft dial to select your slice thickness or julienne setting. All blades are safely covered when not in use. A soft handle set lower than the body ensures a comfortable grip and keeps your hand out of the way, and wide, non-slip feet keep the Mandoline stable and secure on the countertop. The large food holder holds food securely, protects fingers and has a soft grip for added comfort. Storage is a snap: all blades store on board for added safety and convenience, the legs fold compactly, and the food holder snaps underneath. All blades are easily removable for cleaning. 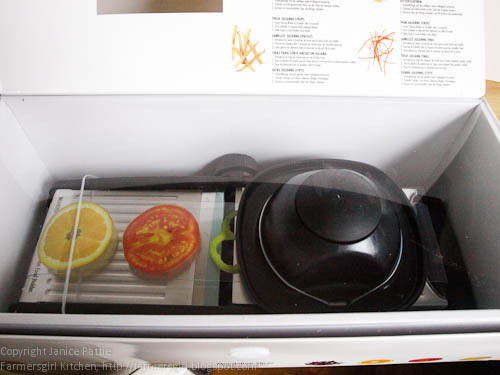 The Mandoline, comes beautifully packaged with full instructions on the box (in many languages) and also in an accompanying booklet. 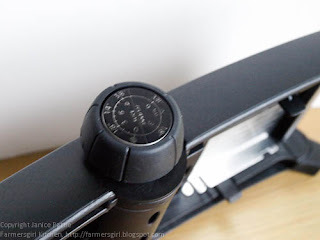 I found the mandoline easy to put together and to dismantle and clean, you do have to be very careful of the sharp blades but the design is excellent so there is no need to touch any of the blades. There is definitely a knack to using the mandoline successfully and some food stuffs are easier to work with than others. You can adjust the thickness of the slices with this dial. I sliced some pineapple which was quite easy to work with as you could give fairly large thick chunks onto the spiked 'handle' and pass them over the blade. I got positive comments about the pineapple slices and was asked how I had got them so thin and even. You do get 'pin' marks in the fruit from the spikes on the handle though. This is butternut squash which also worked well, although you do need to get a good action as this has a much firmer texture, still once I got going it made beautiful slices which I used to make a butternut squash bake. I had a little difficulty with carrots and cucumber, which are featured in the instructions, they are fine when you want to slice them into long slices, but the safely handle didn't seem to work well when you wanted round slices. The difficulty is gripping them with the handle as they are too narrow and too long. I tried cutting them down, but they still fell off the handle when I pass them over the blade. You could slice them without the handle but you would have to be very careful not to get too close or your fingers would be in danger. I'm I have yet to try the waffle cut or the julienne cutters but will be doing so very soon. There's a useful little video on the OXO Good Grips page which shows you how to work with the Mandoline and there are loads more mandoline technique videos on Youtube. I will be persevering with the OXO Good Grips Mandoline, as I like the nice even slices, something my food processor is less good at creating. I'll keep you posted as to how I get on as we move into the spring and summer and I'm preparing more salads as I think this is when the mandoline will come into it's own. 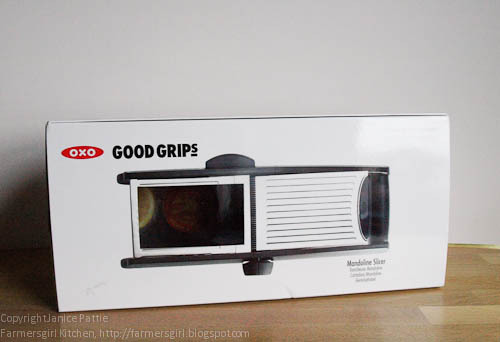 I was supplied with the OXO Good Grips Mandoline to review, I was not paid for this review and all opinions are my own. Im another one that always fancied one of these, save getting the processor out but like my carrots in rounds not length. I would worry about my fingers trying to cut things that you cannot hold onto with the tool very easily. interesting to see how you get on with the other shapes. I had one of these Oxo mandoline slicer few months ago but it got broken by accident..Now i need to buy a new one..